In 1993 Terry obtained his “Black Badge” for IPAC (International Practical Shooting Confederation). IPSC is a world-wide organization with approximately 100,000 shooters in some 65 countries. Terry has competed around the globe with many different firearms, including revolver, pistol, sub-machinegun, assault rifle, and shotgun. The pistol is the most difficult firearm to shoot and handle. Terry excelled in this sport through his dedication and arduous training regime. IPSC is competitive combat action pistol shooting. Scenarios are constructed with a multitude of props and tasks while shooting the assigned course of fire. Targets are generally cardboard and/or steel with assigned scoring areas. These targets may be static, moving, pop-up, weaving, bobbing, disappearing, etc. “No-shoot” targets are almost always added to scenarios. These act as penalty targets to further test a shooter’s decision-making process, skill and nerves. The “scenarios” range from three to 30 targets per course at a distance of three to 60 metres. A competitor has to shot with both their weak and strong hand as well as a conventional two-handed grip. The shooter might be relatively static or the scenario might be laid out over a distance of up to 100 metres. This sport requires speed, agility, skill, timing and mental focus and preparation. Matches range from six to 40 scenarios and cover one to six days of shooting, depending on the match level. Since 1994 Terry has competed in approximately 200 “regional” matches in Canada and the U.S.A. Of these, he has won an impressive 160 and placed in the top three in the remaining 40 matches. These events typically attract between 75 and 200 competitors. Terry had won 15 Provincial Championships as of the time of his induction. These matches typically have had between 200 and 300 competitors. In titles not won, he had placed in the top three at every Provincial Match in which he competed. Also as of the time of his induction, Terry had won two National Championships. These matches generally draw between 250 and 400 competitors. In the years Terry did not win the title, he had placed in the top three at his remaining National appearances. He was also the holder of a North American title and placed in the top 10 at the other competitions he attended. These matches typically involved some 350-500 competitors. In 2000,Terry won the Pan-American title. These competitions generally bring 450-600 elite shooters together from North and South America. 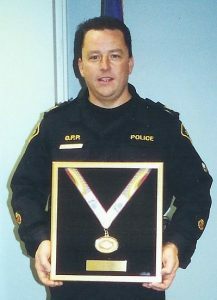 In 1997 Terry placed third in the World Police and Fire Games in the police action pistol event. This event offered him a taste of what was to come. His dedication and commitment to this sport brought Canada to the forefront of this international competition when in 2001 Terry captured the World Championship. The World Police and Fire Games host the world’s most prestigious police shooters and boast participation from such participants as the renowned LAPD SWAT Team as well as many well-known instructors and professional shooters from police agencies and special forces units worldwide. This competition brings out about 600 to 800 shooters from various countries around the world. In addition to these individual titles, Terry has also captained Team Ontario to six National Championships with only four members each time. He was the captain of Team Canada at the Pan-American competition where they captured first place. Terry also represented Team Canada at three world shooting matches. He holds the ranking of “Grand Master”, which is the highest achievable ranking in the world. Terry is a firearms instructor and “Master Instructor”, a title held by only six people in Canada. At the time of his induction, Terry was a Sergeant-Unit Commander and Chief Firearms Instructor for the Ontario Provincial Police.